As a long-time cooking enthusiast, I have owned and used several types of cooking tools over the years, including nylon, wood, bamboo and stainless, in a variety of price points from several different manufacturers. I learned early on that quality counts with kitchen tools. That's why I was so excited when the All-Clad team invited me to test and review their five-piece set of Precision Stainless-Steel Tools. The name All-Clad is synonymous with high-quality cookware, with the brand constantly receiving top ratings from resources like Good Housekeeping, Consumer Reports and more. Now that I have had an opportunity to review their kitchen tools, I can say definitively that their reputation for quality also carries through to their kitchen tools as well. The tools in All-Clad's five-piece Precision Stainless-Steel set are sturdy, stunning and practical - they are the 'complete package' of form and function. Each piece has a great feel when you hold and use it, making it easy to prepare your favorite recipes. Additionally, they are so beautiful that you can just as easily use them for serving as for cooking - even for special-occasion meals. What makes these tools so great? They have several key features that are beneficial to anyone who cooks. This set includes the kitchen tool items I tend to use most often, as well as a large holder with plenty of additional room to store these tools and others you may already have or decide to add to your collection. I tested these tools to prepare and serve a variety of recipes, from basic hamburgers and pancakes to marinara sauce, vegetable soup and several rice dishes, using a variety of cooking vessels, including hard anodized and stainless pots and pans, a slow cooker and an electric griddle. I didn't end up needing to dip into my pre-existing stash of kitchen tools at all to prepare these items (and some others as well! ), so I am confident that the items in this set will meet the needs of most home cooks. 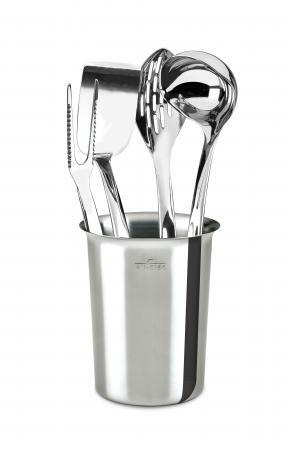 Plus, you can always add individual pieces if you also need speciality kitchen tools. This beautiful and functional set of kitchen tools is easy to use and maintain, and the items are so well-constructed that you aren't likely to ever have to replace them. As CenturyLife.org points out, All-Clad stainless is constructed to "lasts a lifetime." They aren't the cheapest tools out there - this set costs just under $160 - but they are a long-term investment in high quality kitchen tools that you will be able to use for decades. Whether you are outfitting your kitchen for the first time or are looking to expand or upgrade your inventory of kitchen tools, this set is an excellent choice. Disclaimer: The author received a tool set at no cost for the purposes of this review. The opinions presented here are her own.